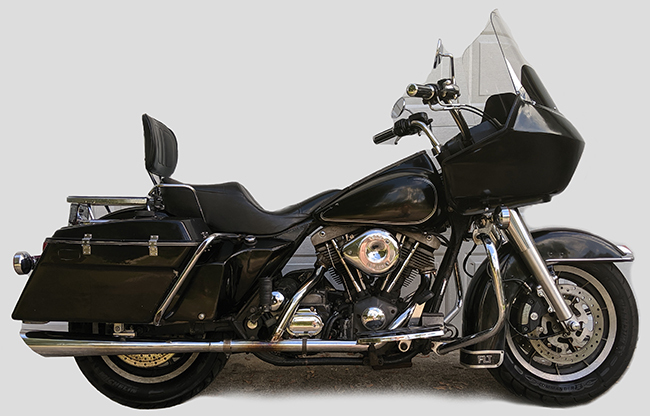 Alice started life as a fully dressed 1981 Harley-Davidson FLTC Tour Glide Classic. She went through I'm not sure how many owners, but it seems clear that none of them were all that kind. She'd been dropped repetedly, wrecked, rebuilt, and finally dumped off to sit in a warehouse boneyard for close to a decade. I picked her up on a Tuesday evening - as-is - for $3,000 and brought her home in the back of my truck. Where she now shares space in the garage with my 2010 FLTRX Trixie, and the wife's car (cages don't get names..). Being that asthetics - for a sleeper - are somewhat irrelevant...her appearance is not likely to change for a very long time. However the plan is that she eventually be repainted Harley Orange, and that she be as devoid of chrome as possible. I've never liked it, and find it to be boaring and unimaginative. The beauty of a machine is - and always should be - in its design and implimentation ... Not in some gaudy, delicate, and maintenance intensive coating.